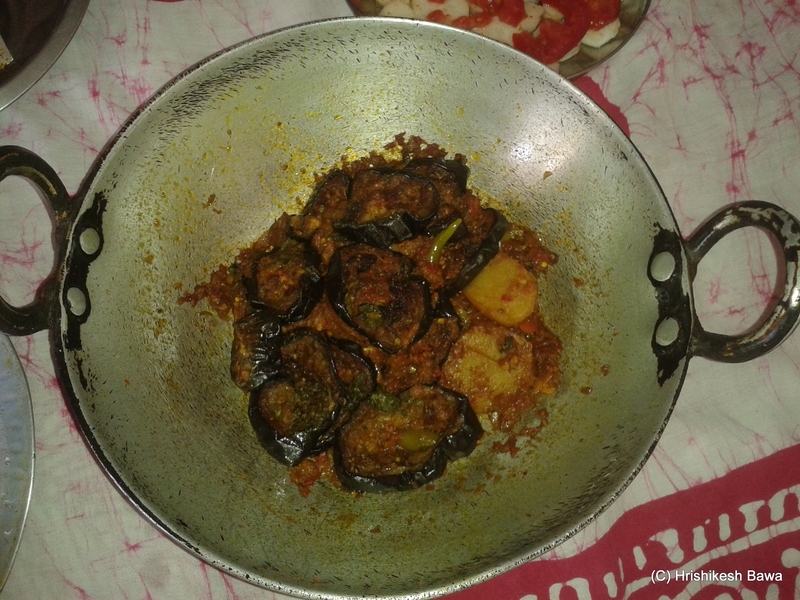 I am not overly fond of brinjals. I try and avoid it if I can, but over the years one particular style of preparation has me grow fond for it. I will share the recipe for this method. 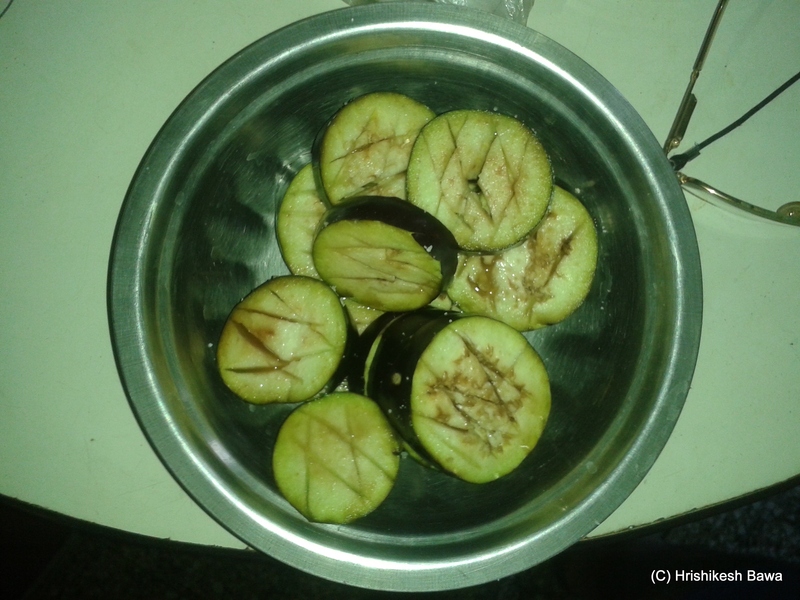 Cut the brinjal in slices 1 cm thick, and make diagonal cuts on it (as shown in the picture). Sprinkle salt on both sides and set them aside for at least thirty minutes. This will neutralize the unwanted excess taste. 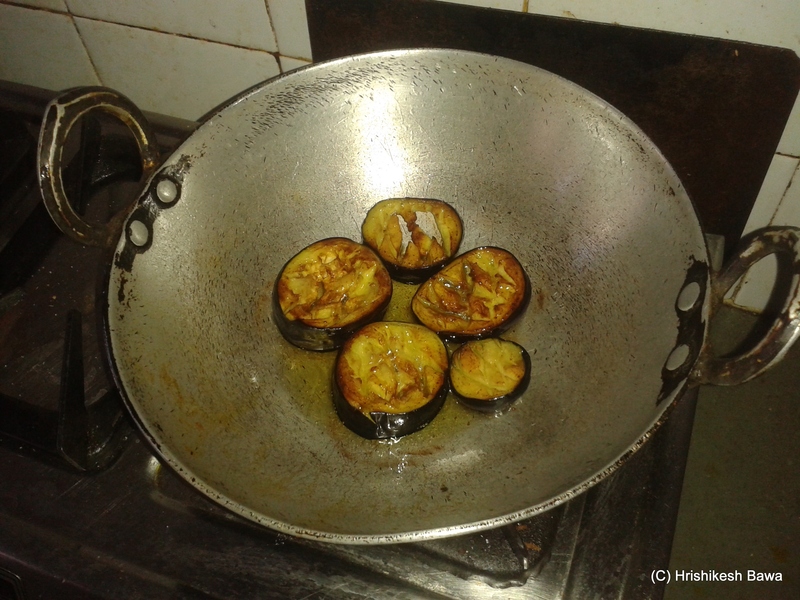 Take out the brinjals and set them aside. Peel the potatoes, and slice them. 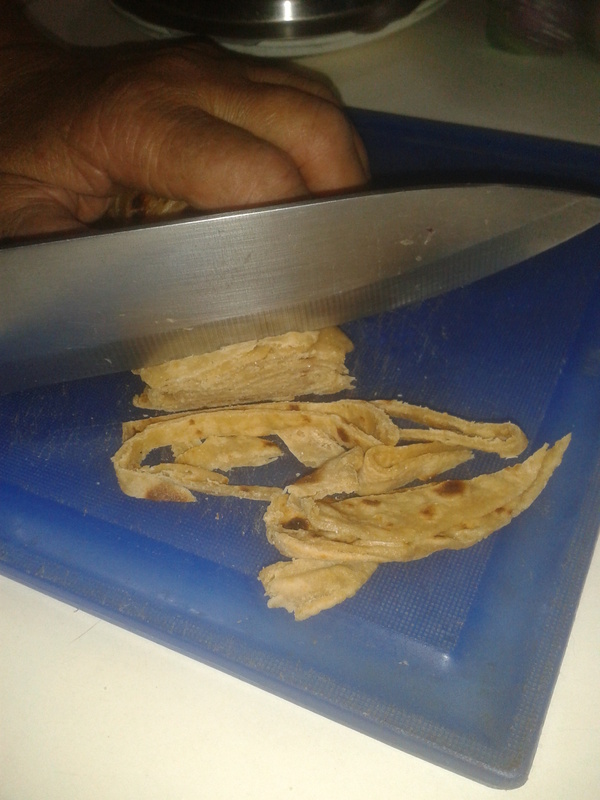 Make the same cuts on them as you did on the brinjal slices. 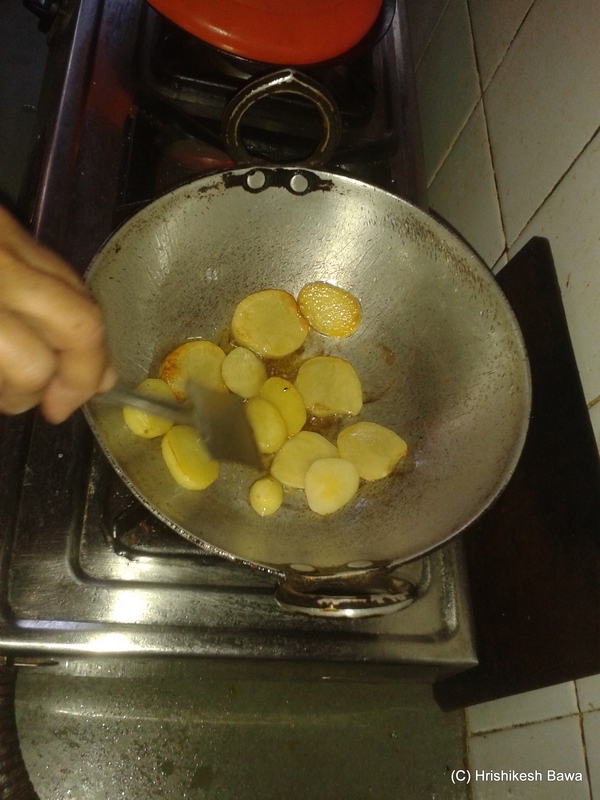 Fry the potatoes in the same oil till they are golden brown on both sides and have a crisp outer layer. Take out the potatoes and set them aside. 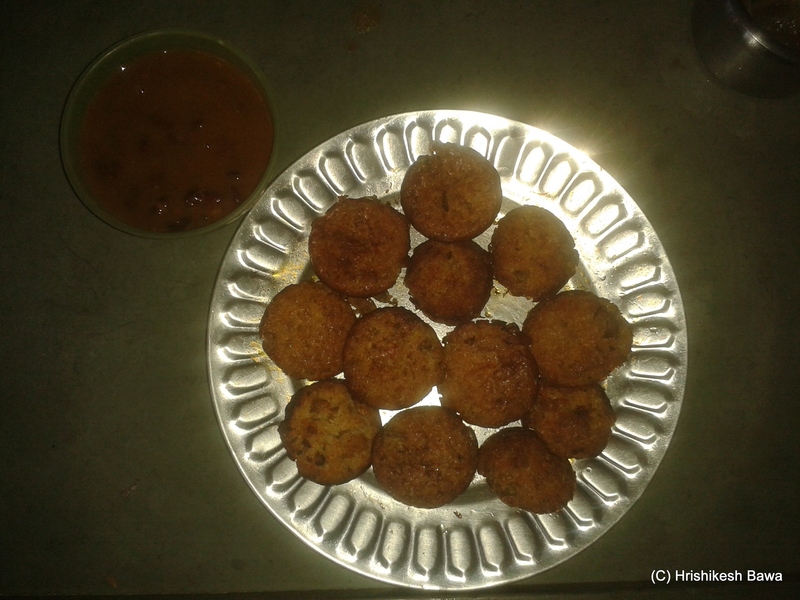 Do not mix them with the brinjal. Cut the tomatoes and put them in a grinder jar / chutney maker. Do notadd water. 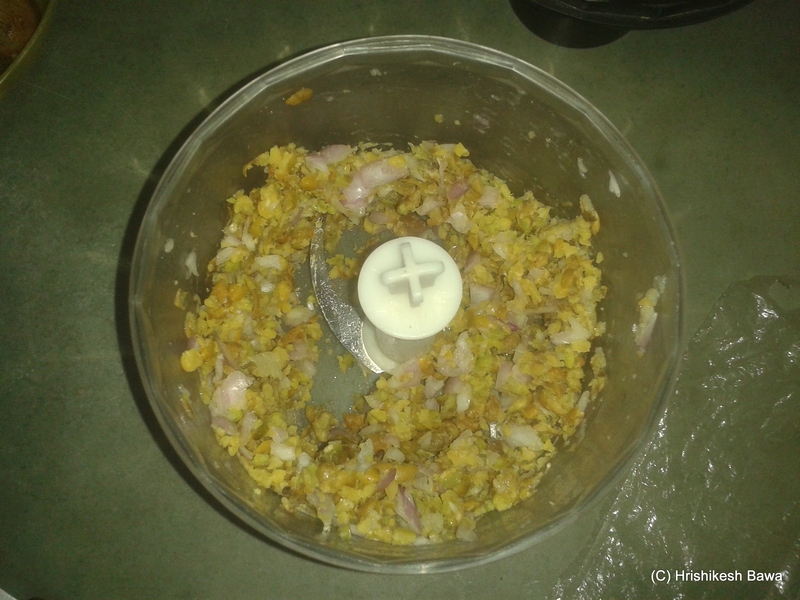 Grind them into a thick dry paste/chutney. The texture you’re looking for is similar to that of a salsa. Heat oil in a pain. Add the onions and garlic. Once they change color, add the chopped chilly too. Mix well. Add the tomato paste. Add all the salt and spices, and mix well. Leave one teaspoon of all spices aside, we will need that later. Add the fried potatoes and mix well. Add water and bring to boil. 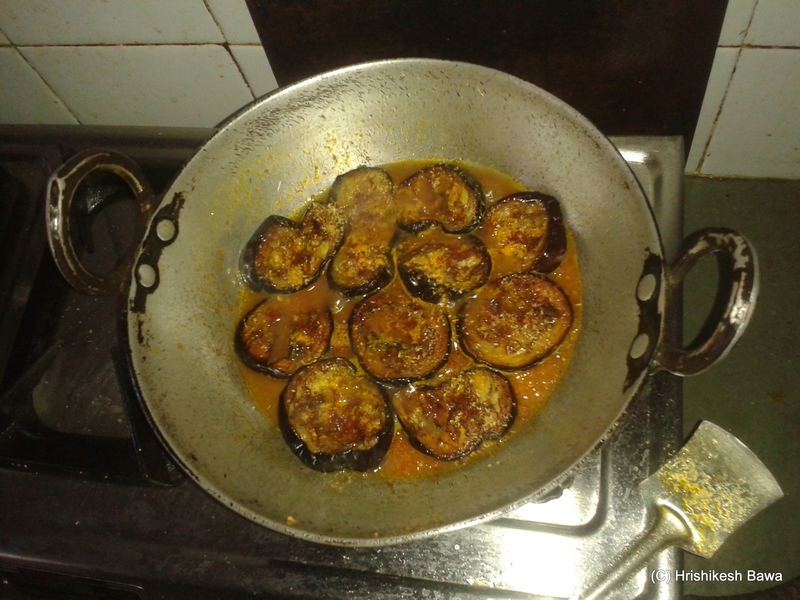 Add the brinjals to this gravy. Place them so that they are just below the surface of the gravy. Sprinkle the spices you had set aside on them. 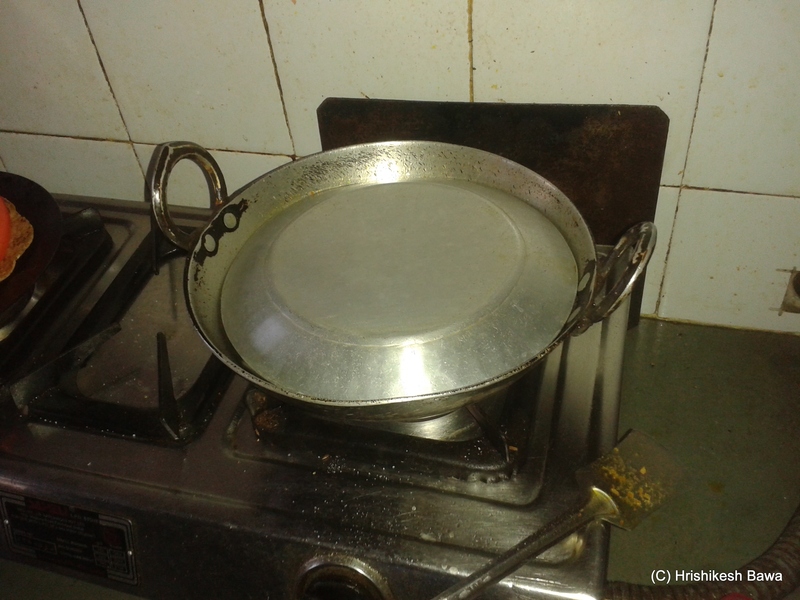 Cover with a plate/lid and reduce the heat to a simmer. 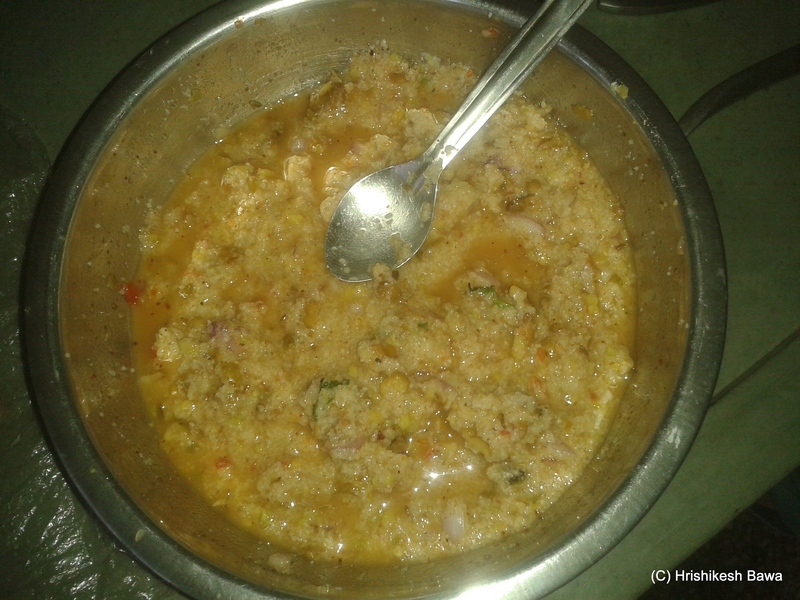 Leave it like this till the gravy is reduced and sticks to the potatoes and brinjals. It will also make them softer. 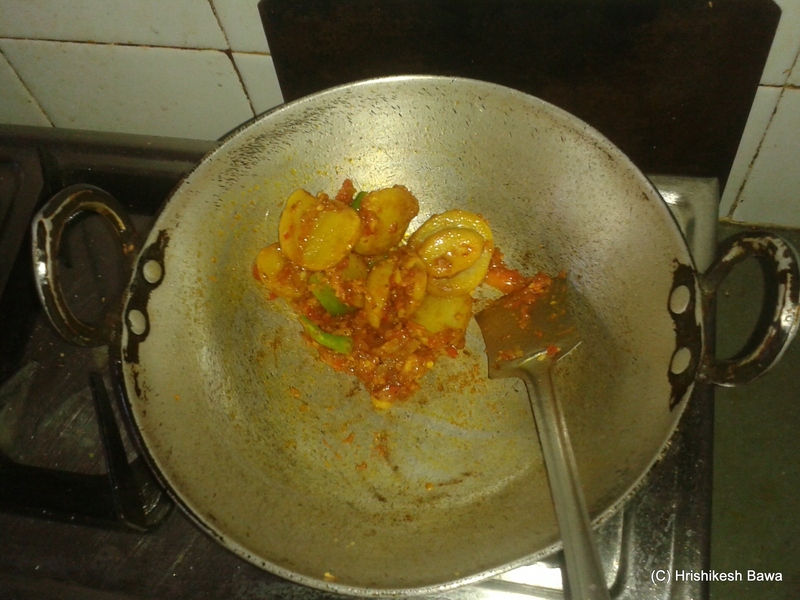 You will need about 5-10 mins for it reduce.You can add chopped coriander leaves or mint leaves at this stage if you like. 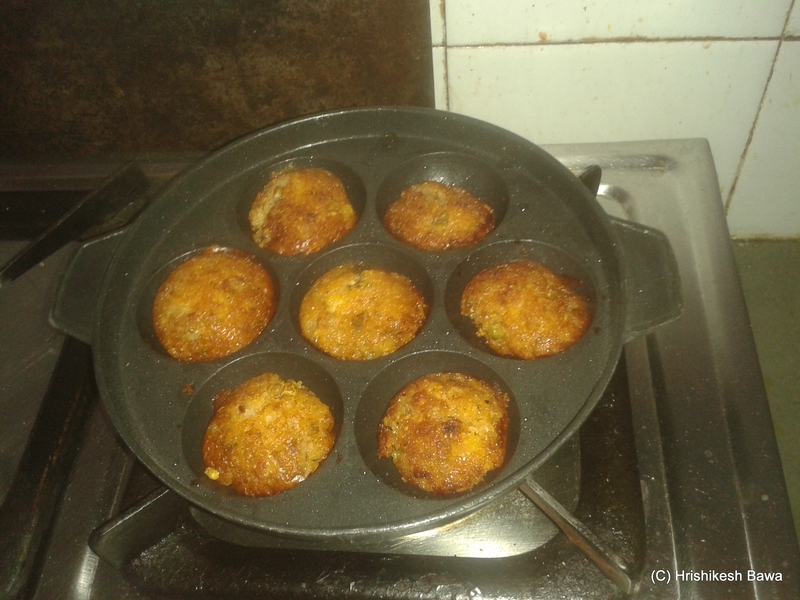 Serve with rotis/naan or any other bread of your choice. 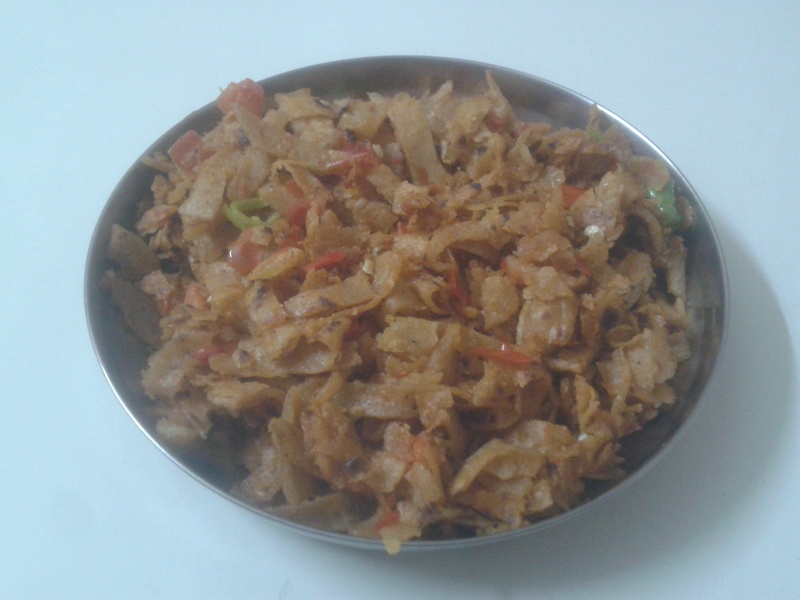 Sindhis make a dish called ‘Sail Fulka’ to use left over rotis. 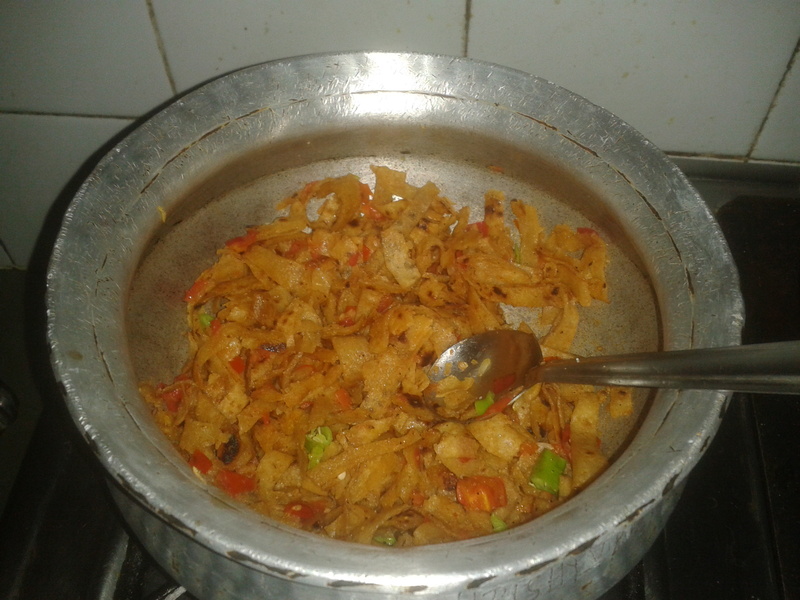 It involves tossing torn bits of rotis in oil and vegetables with spices. 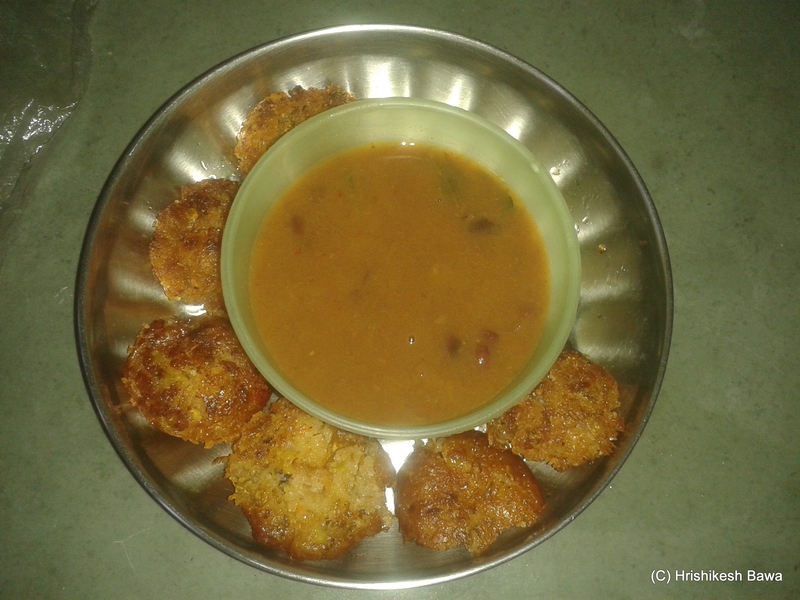 I am adding a schezwan twist to this recipe. 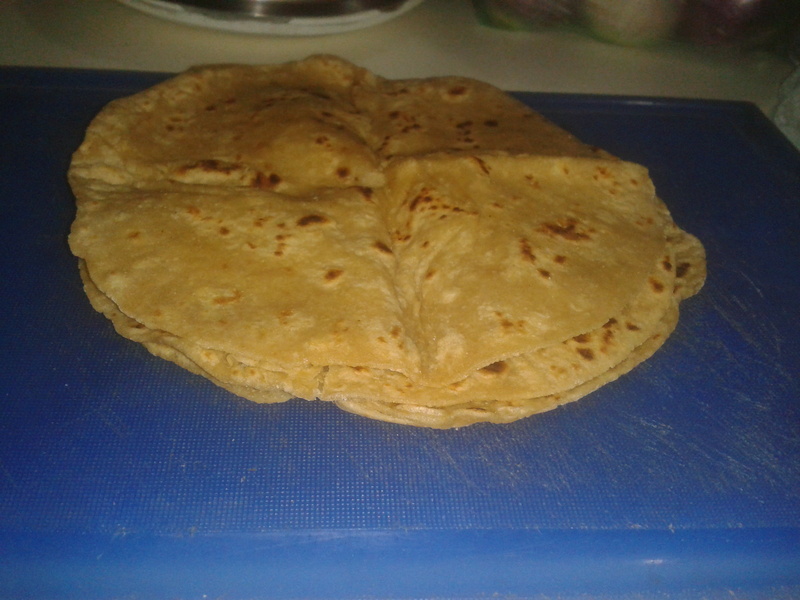 Take the rotis and stack them on each other as shown in the photo. 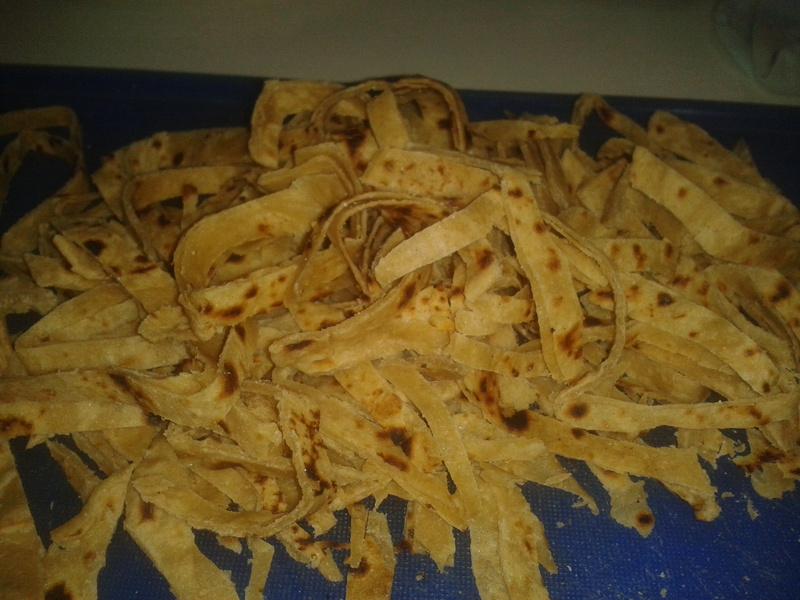 Make a roll out of these, and cut them across the length of the roll as you would cut a carrot or cucumber into discs. Now heat the oil in a vessel, and add the vegetables to it. 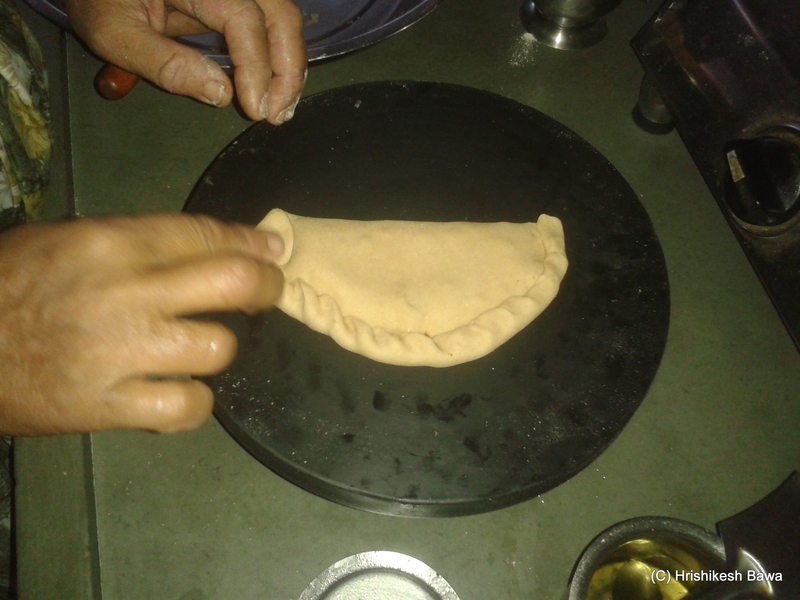 After the tomatoes turn soft, add the roti ribbons, a handful ribbons at a time. Keep tossing to prevent the ribbons from sticking. 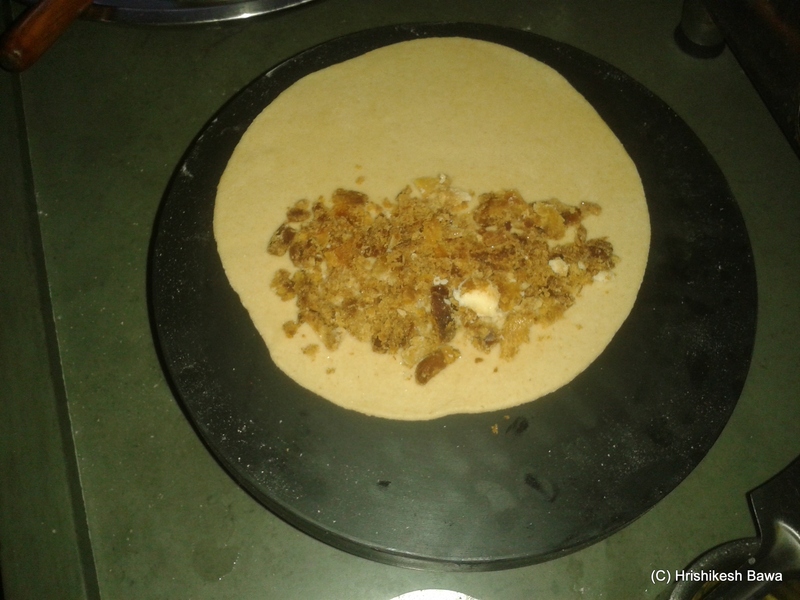 Once the rotis are well coated with the oil and are getting crispy, add the spices and sauce. Toss well. Toss a little more, and serve. If you don’t want to use Schezwan sauce, you can substitute that with tomato puree and adding garlics when you first heated the oil. If you want to make the ribbons a little mushy, then add a cup of water when you toss. 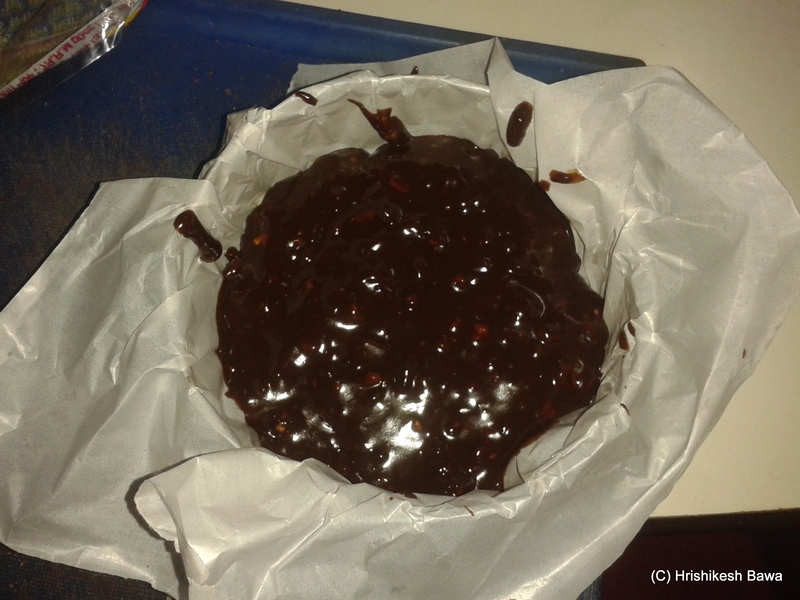 I was reading the recipe of Chocolate Mini Tarts at Hungry and Excited, and it looked so delicious that I wanted to make them myself. 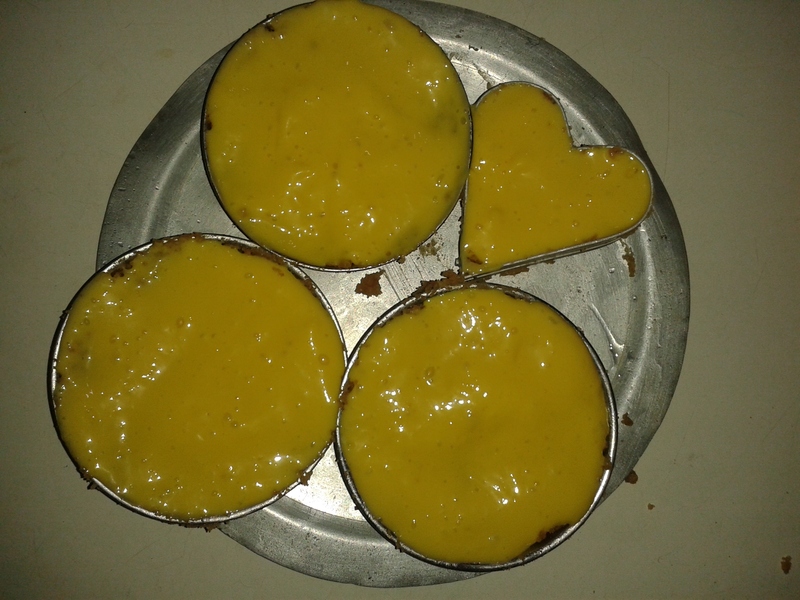 Since mom has a certain dislike for all things chocolatey (rolls eyes), and the oven was tucked away below a pile of other things, I modified her recipe a little to make a no-bake recipe and utilize the fresh batch of Kesar Mangoes that had just arrived. 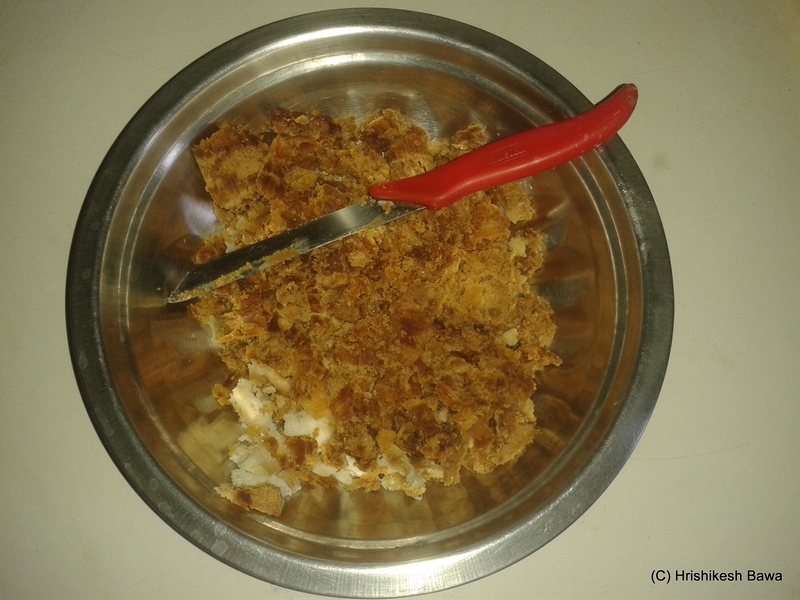 Take the digestive biscuits and run them in a food processor or chopper. 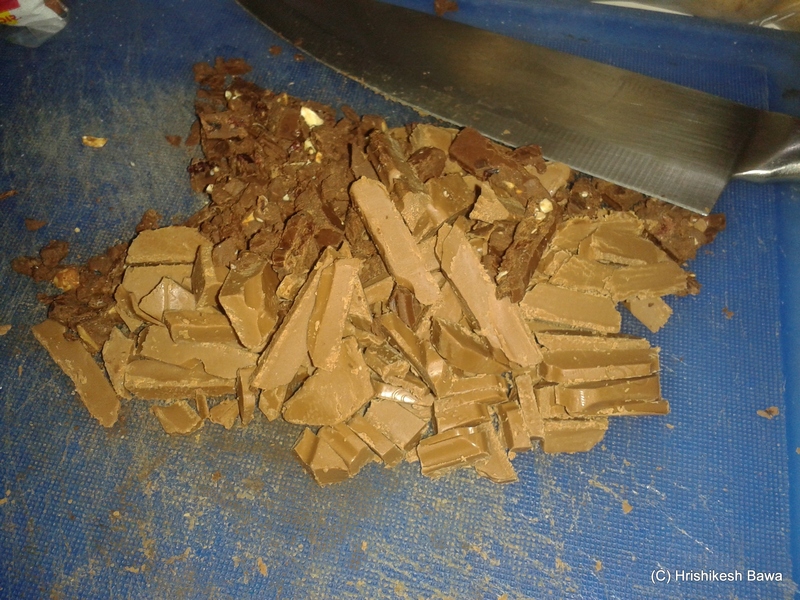 Alternatively, If you don’t have a processor then wrap the biscuits in a bag and use a rolling pin or another tool to whack them into tiny crumbs. This is what they looked like once I had a go with them in my chopper. Take the butter (or ghee if you don’t have un-salted butter). Melt the butter, and pour it in the biscuit mixture. Run the processor / chopper once again to ensure that they’re mixed well. 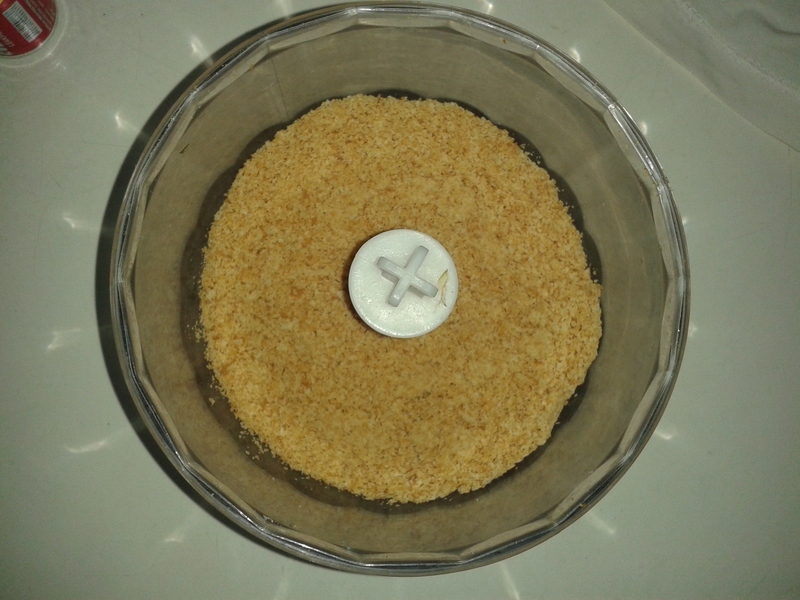 If you have used the rolling pin method, then mix the butter and biscuit crumbs well with your hand. 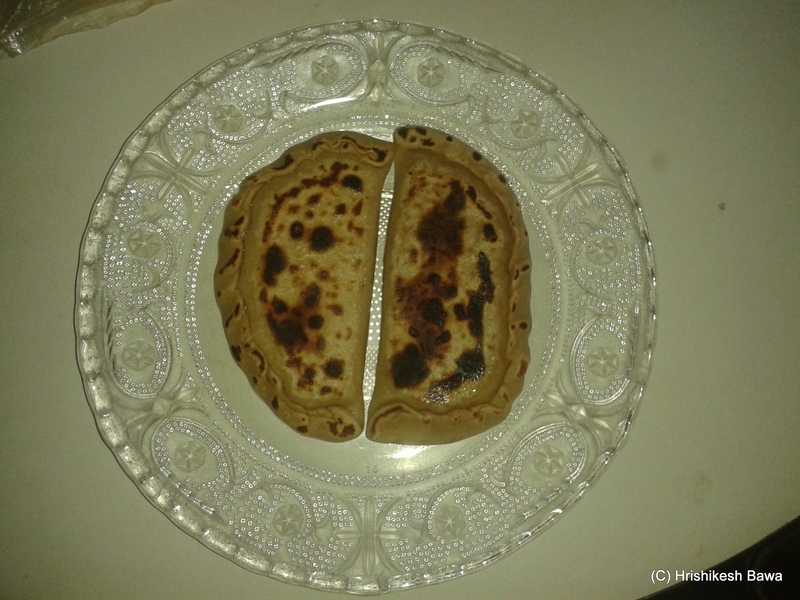 This is what they looked like when I made them. 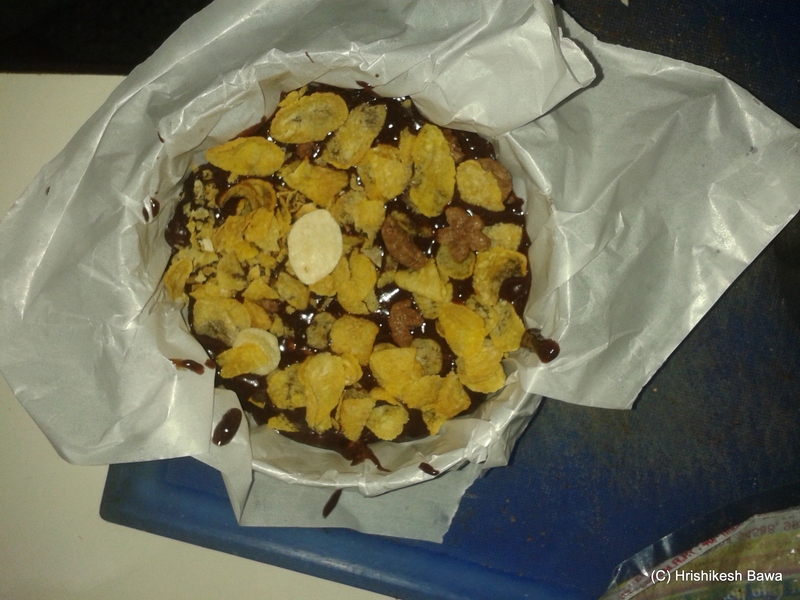 Take moulds and grease them lightly. I did this by wetting a small piece of cloth with the melted butter and dabbing it around the inner surface of the moulds. 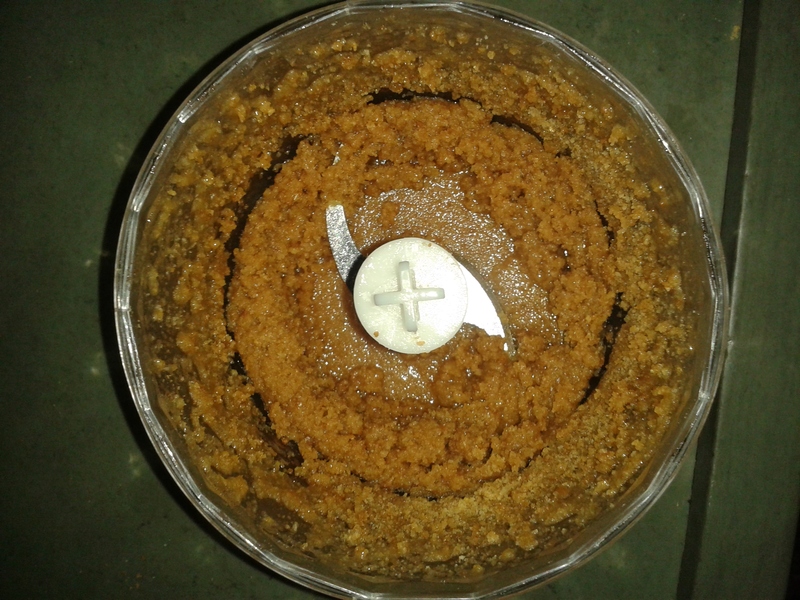 Place the biscuit crumbs on the mould and press them hard with your fingers or the back of a spoon. Place them in the freezer for 15 minutes. 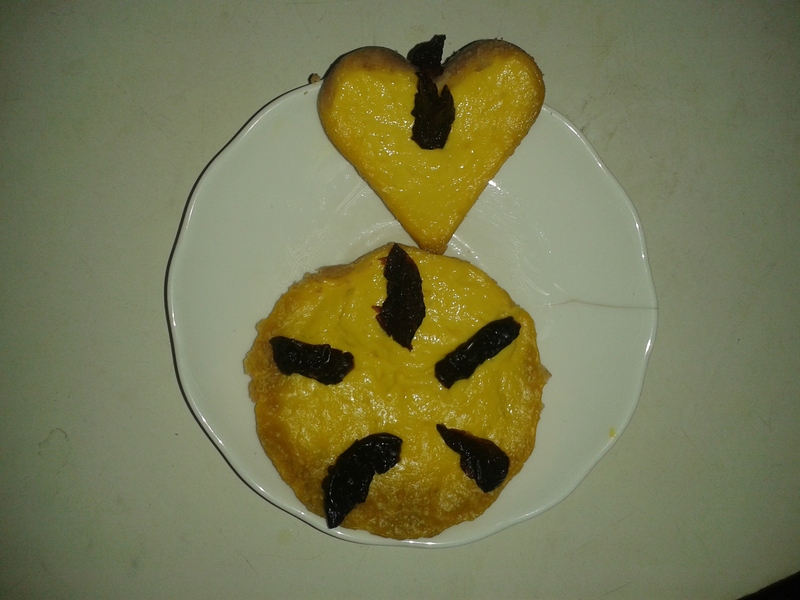 I don’t have any tart/cupcake moulds with me and use small katoris as moulds instead. This is how they looked just before I put them in the freezer. 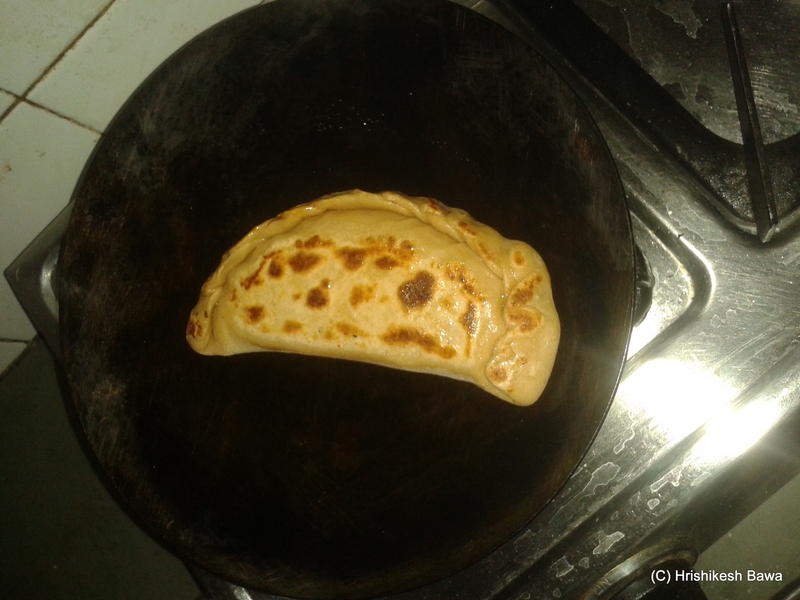 Blend the cream and mango together till you get a uniform thick consistency. 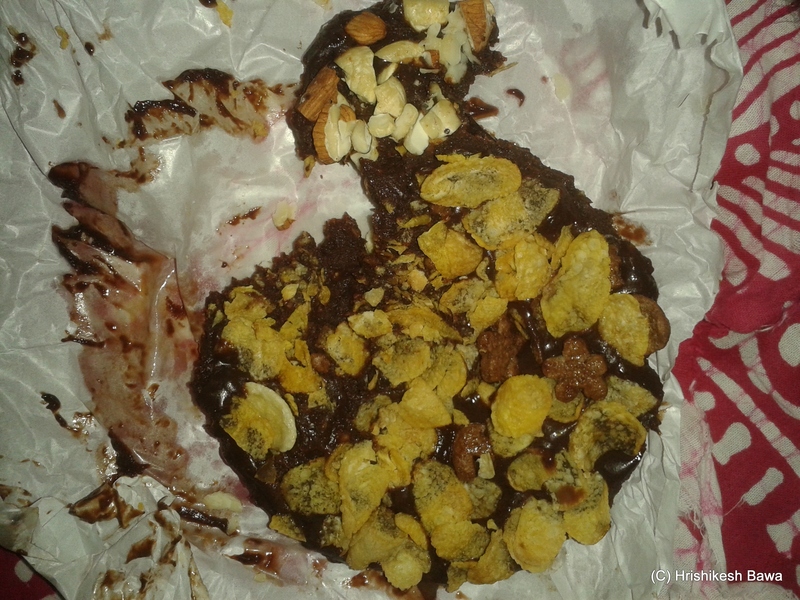 Pour this mixture on the moulds with the help of a spoon. Try and cover the entirety of them with the mango-cream blend. Place them in the freezer for 2 hours. 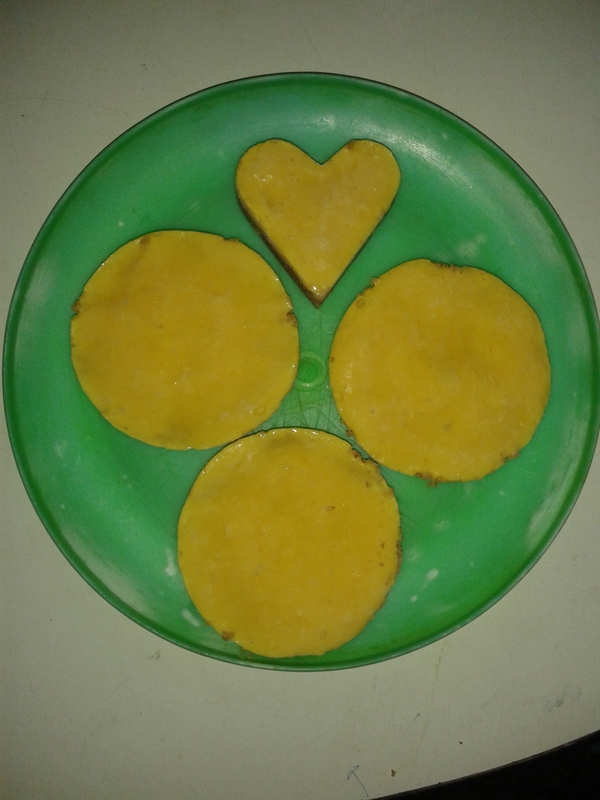 I was able to scavenge for 1 heart shaped mould from mom’s supplies. This is how mine looked before freezing. 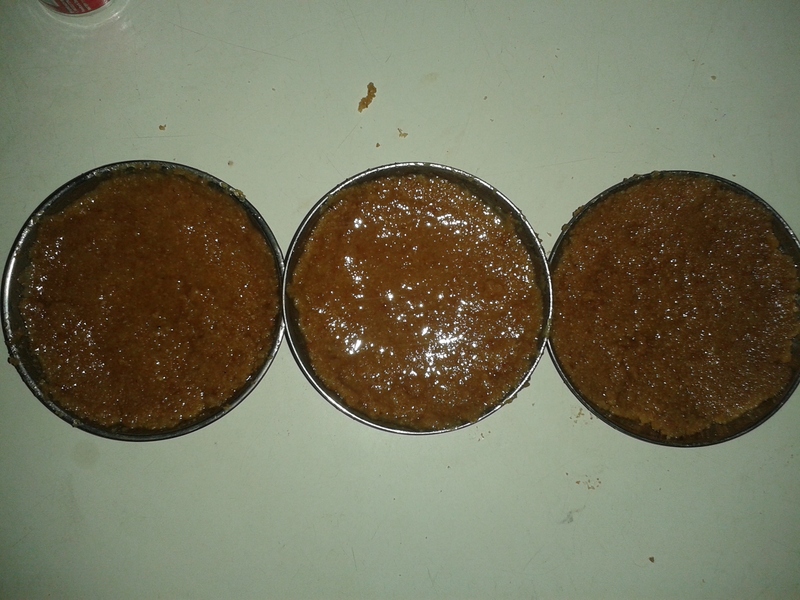 After removing them from the freezer, just a small pinch on the outside of the moulds will release the tarts. Keep them in the fridge for another hour. You can now happily enjoy them as they are. Alternatively you can garnish them with what you like. 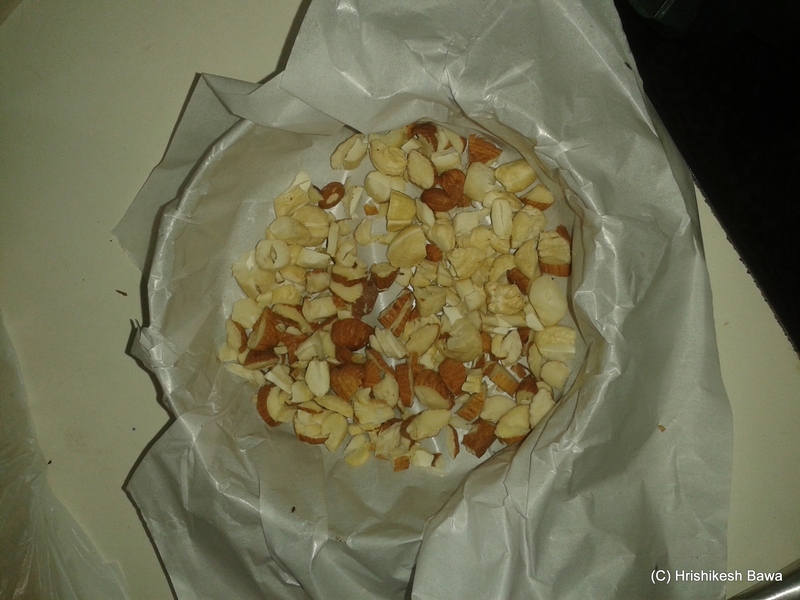 Typically, you can use cut up fresh fruits and dry fruits. Since I had prunes with me, I used them. This is the final result. 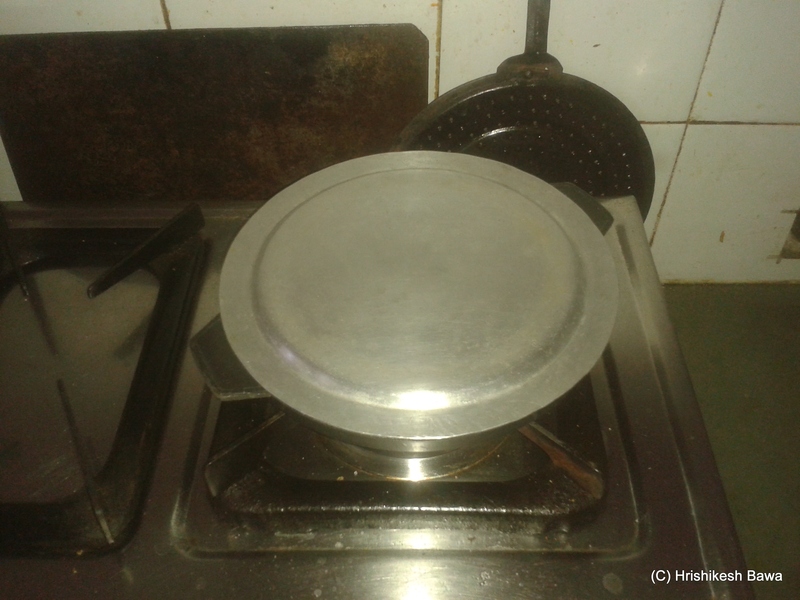 Take 1 litre of water in a wide bottomed or deep vessel. Add 1 table spoon of salt. Bring the water to boil. Let the pasta boil for 10 minutes, stirring every three minutes. Strain the pasta in a strainer. You can choose to drain away this starchy water or save it to be used as stock in other recipes. Now transfer the pasta in a bowl. Fill it with cold water, and drain the pasta in a strainer. Repeat till pasta is cold. This way the pasta will not stick together. Now transfer pasta in an empty bowl. The pasta should not be more than half the bowl’s volume. We will use this empty space later. Heat 3 table spoons of Fortune Rice Bran oil in a pan. 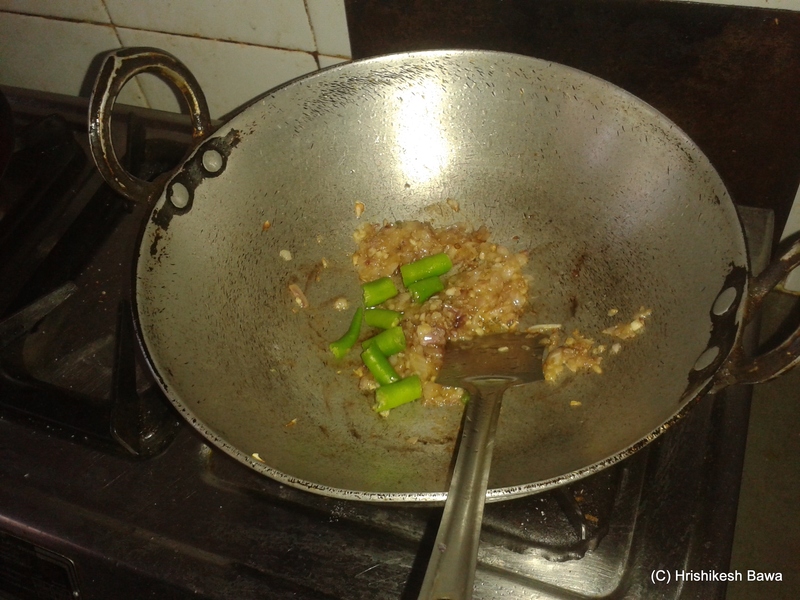 Add the finely chopped onion and garlic. Sauté till onion turns golden brown. Add the thinly sliced mushrooms. Add 2 table spoons of oil. Sauté till mushrooms change turn slightly brown. Add the tomato puree, and stir. Add Chilli sauce, chilli flakes, hing and salt. Continue to stir. 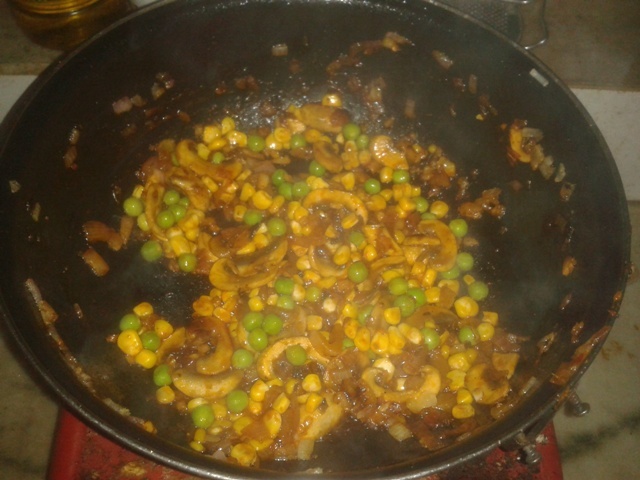 Add the Corn kernels and peas. This will form the soup. 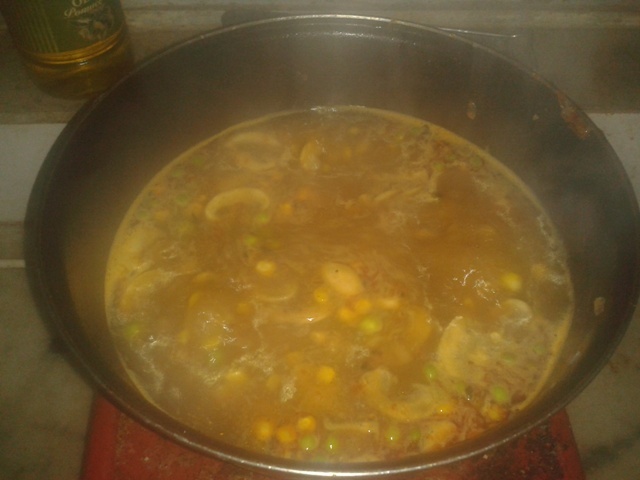 Let it boil for 5 minutes by when the corn and peas should soften. Pour this soup over the pasta kept in the bowl.Voila, you’re done. You can choose to garnish with sprigs of basil or coriander. But I like to have it as it is. 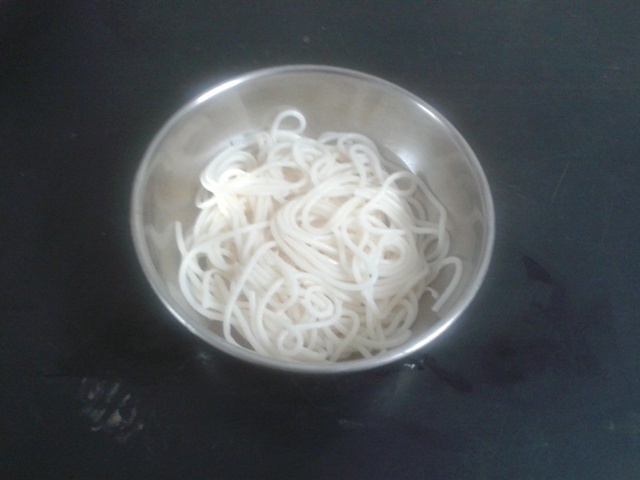 Now some of you may wonder that this looks like soupy noodles. 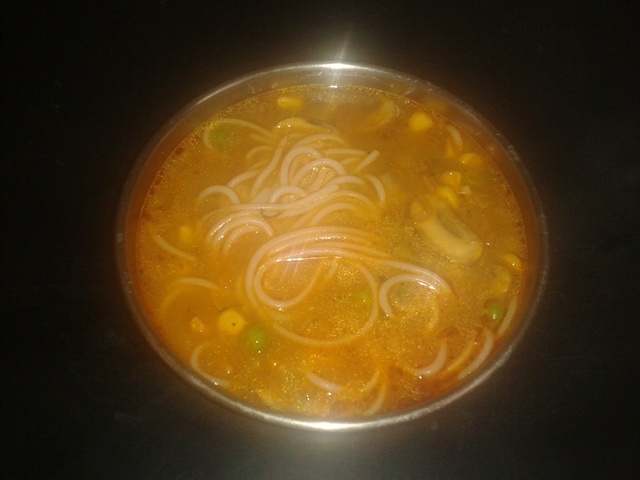 Yes it looks like soupy noodles because I chose to use Wheat Spaghetti instead of noodles which are made from Maida (or refined white flour.) You can replace the spaghetti with penne, fusilli or any other pasta as well. 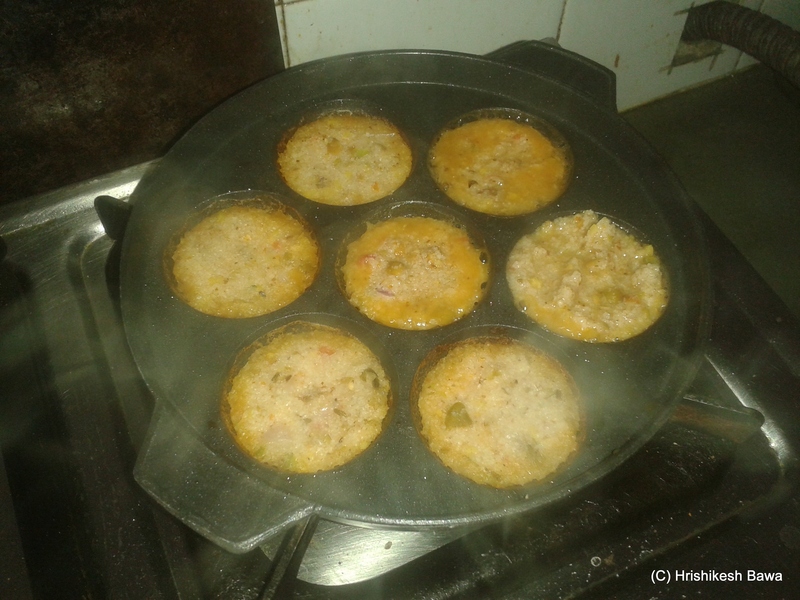 You’re also using Fortune Rice Bran oil, so that adds to the healthy quotient as well. Please do tell me how it turned out for you.